The El Cajon Little Leaguers needed a solid relief performance to ensure a slot in the 1977 Little League World Series championship game and Andy Hall delivered. The young California hurler and outfielder, changed positions from the outfield to the mound to get the final three outs to eliminate Rotterdam, NY's Carmen Little League by a score of 6-3, according to The Associated Press. Hall went on from the Little League World Series years later to turn pro, and focus on another position change. The professional catcher Hall played a total of nine seasons. He made AAA, but not the bigs. Hall's pro career began in 1983, taken by the Pirates in the third round of the draft out of El Cajon High School. He started with the Pirates in the rookie Gulf Coast League. He got into 40 games as a catcher and hit .287. Hall then started 1984 in Pirates camp. He played the season at single-A Macon. He hit .190 in 73 games. He played briefly at short-season Watertown in 1985 then a full season between Macon and short-season Tri-Cities in 1986. He hit .208 on the year with six home runs. Hall first made it above single-A in 1989. He made AA Harrisburg and then AAA Buffalo. A fielding miscue in the outfield led to a Hall triple that scored two in a May game for Buffalo. 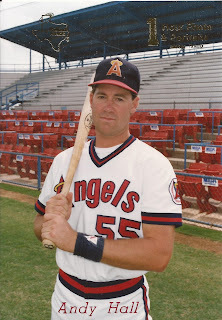 Hall moved to the Angels system later that year and got time at AA Midland. He saw eight games there to finish out 1989. Injuries then limited his 1990 playing time to just seven total games. Hall played one final season in 1991, at independent high-A Miami. He hit .175 over 39 games to end his career.